A unique filter for many different astronomical tasks. Incomparable in accracy to combinations of generic color filters made of raw polished glass – where surface inaccuracy adds up in the optical wave front to an unbearable degree! Especially designed to improve the ubiquitous beginners telescopes – to provide a professional replacement for the simple `dark green` Moon & Solar-Filters made of `raw polished` glass. Removes the bluish hue (= lack of contrast) during lunar, planetary, solar, and terrestrial observation! Strongly emphasizes surface detail on Jupiter and Mars! If you have never seen the GRS (Great Red Spot) on Jupiter – with this filter you will! Over 95% transmission – provides a bright, brilliant image compared to the usual dark green color filters, used to bring out detail on Jupiter. Color recognition will be retained! The ultimate in lunar filters! Moon (and Sun!) appear much more natural in color (with a slight yellowish tint, compared to the usual low priced dark green Moon-filters, usually offered for beginners telescopes. Completely removes distracting false color and the resulting washed out image details. You have never ever seen the Moon or the Sun (with AstroSolar Safety Film) so tack sharp in an economy priced telescope! Blocks atmospheric `stray light` (skyglow). Sky-background turns into pitch black! Fits each and every standard filter thread; Combines with the (planeoptically polished) BAADER Infrared Cut-Filter. In this combination all blue scatter as well as unfocused near infrared light is completely removed – an absolute MUST for digital imaging! 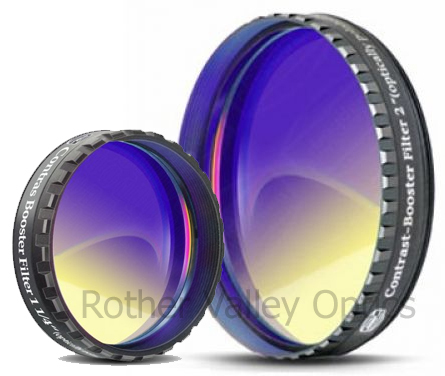 No deterioration of resolution with magnifications of 200 x and more – as with `raw polished`(flame polished) glass! A significant part of City Light Air Pollution, as well as Atmospheric Skyglow is removed from the telescopic image.